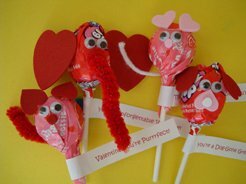 These Valentine Lollipop Animals are so cute and so easy to make! The perfect edible valentine to give or keep! We used Tootsie Pops and Blow Pops, but you can use any Lollipop at all! You can write you own tag out, or you can print out ours! Each tag says something different: The Elephant tags says "You're Unforgettable Valentine"; the Mouse tag reads "This May Sound Cheesy, but you're great! "; the Cat tag reads "Valentine, you're purrrfect! "; the Dog Tag says "You're a Dog Gone Good Friend". These are great Valentines for boys and girls! 1. Glue on 2 hearts, upside down, on top of the lollipop for the cat's ears. Glue on 2 google eyes and a small nose. 2. To make the tail wrap a pipe cleaner around the stick part of the lollipop. 3. Glue the cat's tail in place on the back of the lollipop. 4. Wrap the tag around the stick and secure with tape or glue. 1. Glue two hearts on either side of the lollipop to make the dog's ears. Glue on 2 google eyes and a small heart, upside down, for to dog's snout. Glue on a small circle to make his nose. 2. Wrap the tag around the stick and secure with tape or glue. 1. Glue on 2 small hearts on the top of the lollipop for the mouses ears. Glue on 2 google eyes and a small nose underneath. 2. Cut off a small piece of yarn or string and glue it to the back of the lollipop for the mouse's tail. 3. Wrap the tag around the stick and secure with tape or glue. 1. Glue on 2 big hearts on either side of the lollipop for the elephant's ears. Glue on 2 google eyes. 2. To make the elephant's trunk wrap a pipe cleaner around the stick of the lollipop. Bend and shape it into a trunk and glue it on.